My basic advice boils down to this: this is the 1st time I’ve ever suggested that people buy the newest version of Windows with a new computer before a service pack is launched! In fact I’m using Windows 7 on my laptop and plan to install it on my office PC soon as well. However if you have an old PC running Windows XP or Vista and you’re happy with it’s performance stick with it for now. The minimum $199 cost (for Windows Vista Users upgrading to Windows 7 Home Premium) upto $469 for boxed Windows 7 Ultimate is too expensive. Note: the initial RC 7100 version of Windows 7 that I tested was publicly available to everyone. The rest of my review is based on a copy of Windows 7 Ultimate which was given to most/all Australian technology media/journalists. Put simply, Windows 7 is greater than the sum of its parts. And while no software is perfect, Windows 7 is the right product at the right time. It is an astonishing accomplishment, even more so when you compare it to its direct predecessor, Windows Vista, which was (and still is) a fine product, sure. But Vista was also the wrong product at the wrong time, a victim both of Microsoft’s mistakes and a lack of acceptance in the marketplace. Luckily for Microsoft, Windows 7 is more than just spin. It’s stable, smooth and highly polished, introducing new graphical features, a new taskbar that can compete handily with the Mac OS X dock, and device management and security enhancements that make it both easier to use and safer. Importantly, it won’t require the hardware upgrades that Vista demanded, partially because the hardware has caught up, and partially because Microsoft has gone to great lengths to make Windows 7 accessible to as many people as possible. The install process was WIN for me. All the drivers were installed after windows update. Vista required 3rd party installs etc. Wifi is easier to configure. Suitable to older PC’s not just high spec new ones – and runs well on them. Windows Media Centre – Excellent stuff – I almost can’t live without it now. Usability – it’s just easier to use, to customise and work your way around. Pop Ups – Not so annoying and controllable. for the record, I’ll be purchasing several copies of win7 in the next year for my pc’s. From a personal perspective it has been usability – the small tweaks and features for power users (Aero snap, peak, shake, etc). Also networking and media sharing are so simple and easy in Win7, compared to XP and some respects even Vista (esp. file sharing). Main + over Vista would be performance. Main + over XP I’d say security & reliability. I can’t comment too much on the tweaks from Vista (I stuck with XP) but the phrase “everything just works” comes to mind for Windows 7. Coming from XP = WIN 🙂 Taskbar nice and clean, Pinning, Snap Windows is great also + miniwindow previews on your tabs. Wiping your current version of Windows and Installing Windows 7 from scratch will always provide better results. However for the sake of convenience many people prefer to upgrade an old version of Windows to a new version by installing it on top to keep their settings & applications. Upgrading in this way to Windows 7 only works if you’re currently using Windows Vista. If you’re using Windows XP or Windows 2000 “Migrating” using Windows Easy Transfer which will assist in migrating user data and application settings is the only option besides wiping the computer and starting afresh. You will still need to reinstall all your applications if you take the Migration option. Installing Windows 7 was surprisingly easy. Make sure you use your fastest usb drive (with at least 2.5GB free space) if installing to a netbook/laptop without a DVD drive. It took roughly 30 minutes to install Windows 7 on the laptops I tested which had an empty hard disk drive and 40 minutes for the laptop with existing Windows Vista installation which had to be wiped first. Installing Windows 7 was much easier compared to Windows XP which required lots of drivers (video, sound, motherboard etc) to be installed manually. However on 1 laptop with a Ralink WiFi card I needed to find and download a Windows 7 driver on another computer and install it on the laptop via a USB drive to get WiFi access working. Runs OK with just 1GB RAM and very well with 2GB RAM which is a big improvement compared to the excruciatingly slow Vista. Supports touchscreen technology if you have a touchscreen computer monitor. Windows 7 also comes in a 64 bit version. For most people this won’t be relevent, however if you have 4GB or more RAM in your computer you’ll want to get the 64bit version because 32bit XP, Vista and Windows 7 can only use just over 3GB of RAM even if more is installed. There aren’t any HUGE new features in Windows 7, instead Microsoft has concentrated on making the user experience faster and easier so the operating system gets out of your way and lets you finish work quickly. The main improvements and new features are listed on the Windows 7 site. Almost all parts of the laptops tested such as sound card, video card, TV tuner etc were detected automatically by Windows 7 and worked without manual driver installation but it wasn’t perfect. Windows 7 doesn’t include an inbuilt virus scanner, Movie Maker, Mail, Instant Messenger applications etc because of anti-trust issues in the USA and European Union. These are available as free downloads from the Microsoft website in 2 packages Windows Live Essentials and Microsoft Security Essentials but I fear most average PC users won’t be able to figure this out. heard the new windows 7 is really cool.but my questions is if those boys at Microsoft can gurantee us that it wont be another windows vista. im using vista and i hate it. NOTE: Tivo Australia is advising it’s customers to avoid upgrading to Windows 7 until November when Windows 7 compatible TiVo Desktop software will be launched. I’ve been waiting and waiting to get rid of vista. What a useless OS. I got Windows 7 through my uni and sofar its flawless! It even let me upgrade from vista and kept all my settings. And I mean ALL my settings. Good work Windows, I’m starting to realize why I dont have a mac again. I am not much of an OS freak myself. Never thought I would upgrade to Win 7. But then Win XP on my laptop crashed and I upgraded to Win 7. I’ll just add I love it. No way am I going back to Win XP. I am glad I upgraded to Win 7. 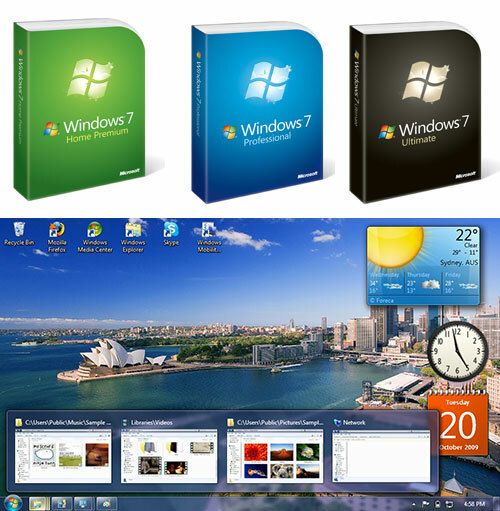 Responding to criticism over the lack of the Windows 7 Family Pack at last month’s launch of the new OS, Microsoft Australia has rushed to roll out the bundle — which includes three licenses for Windows 7 Home Premium – for $249 on a trial basis. I’ve got windows 7 – loaded up Wordperfect 12 and Quicken 2007 but neither will open. What’s up? I’ve gone through Windows 7 compatibility and no good. I have windows 7 and really enjoy it, mostly because its very stream line and flexible, for instance, back when i wanted to launch a file through a certain program, i had to browse through directories, now i just type it in the search box and bam! its there, its easy and functional. Also the other plus side was that i got it from tafe for free since i am a student and the tafe have their msdn dealio, though thats meant to be ending sometime.